A team from UCL, Great Ormond Great Ormond Street Hospital for Children and the University of Hertfordshire, recently presented the latest developments in their antimicrobial filters research, at a stakeholder event held at the UCL Institute of Education. The novel antimicrobial filters, developed at UCL, actively kill bacteria and viruses in water and air. The filter fibres incorporate metallic nanoparticles which exert a strong antimicrobial effect. The novel filters for water and air with embedded antimicrobial intermetallic nanoparticles kill over 90% of tested microorganisms in seconds. 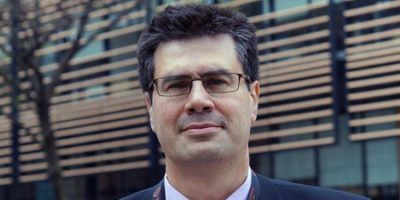 At the University of Hertfordshire, preparations of antimicrobial nanoparticles were manufactured and selected according to their performance in antimicrobial assays. The nanoparticles that had the best antimicrobial activity consisted of a combination of intermetallic nanoparticles with multi-elemental compositions including silver, copper and zinc. It was found that combining a number of metals in nanoparticles significantly increased the antimicrobial effect. The nanoparticles were then embedded into polymer fibres by using a pressurised gyration technique pioneered at UCL Mechanical Engineering. 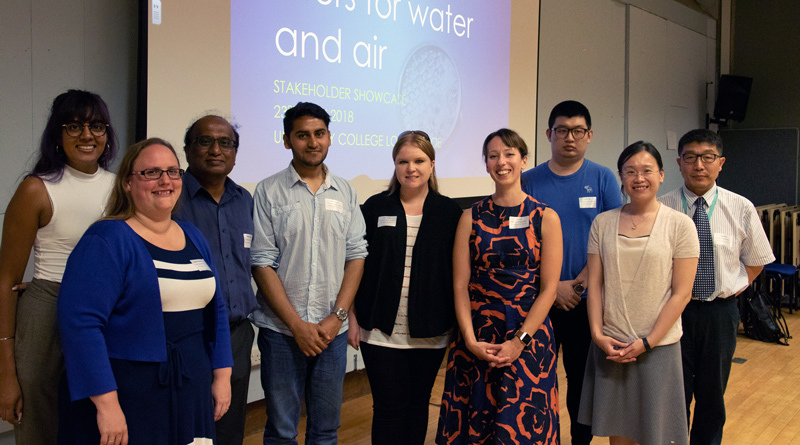 Research team (L to R): Rupy Matharu (UCL MechEng), Dr Elaine Cloutman-Green (Great Ormand Street Hospital), Prof. Mohan Edirisinghe (UCL MechEng), Jubair Ahmed (UCL MechEng), Dr Claire Bankier (UCL CEGE), Dr Lena Ciric (UCL CEGE), Xiuyi Yang , Dr Yuen-ki Cheong and Dr Guogeng Ren (all from University of Hertfordshire). This novel fabrication process is a hybrid technique that combines centrifugal spinning and solution blow spinning. It uses speed and pressure to transform polymer solutions into uniform ultrafine fibres, resulting in a filter-like mesh. Each filter can be made in 180 seconds. The novel antimicrobial filters were then tested for activity against the bacteria Pseudomonas aeruginosa and Staphylococcus aureus, well known human pathogens, to assess their effectiveness. Flow cytometry was used to enumerate live and dead cells before and after filtration. The team is now in the process of testing the filters’ effectiveness against two common viral pathogens, influenza A and adenovirus, during air filtration. This collaborative project is coordinated by Dr Lena Ciric at UCL’s Department of Civil, Environmental and Geomatic Engineering (CEGE). The antimicrobial testing was carried out by Dr Ciric’s team in collaboration with Dr Elaine Cloutman-Green from Great Ormond Street Hospital for Children. The nanoparticle analysis and preparation were carried out at the University of Hertfordshire Centre for Engineering Research by Dr Guogeng Ren’s antimicrobial nanoparticle team. 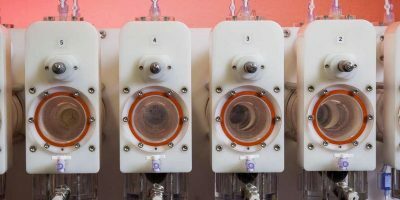 The manufacture of the filter fibres was carried out at the Biomaterials Processing Laboratory, UCL Mechanical Engineering, led by Professor Mohan Edirisinghe FREng. The researchers on the project are Dr Claire Bankier, Dr Yuen Ki Cheong, Dr Suntharavathanan Mahalingam, Mr Jubair Ahmed and Miss Rupy Kaur Matharu. The project is funded by the Engineering and Physical Sciences Research Council (EPSRC) EP/N034228/1 and EP/N034368/1 with generous support from industrial partners GAMA Healthcare Ltd, Intrinsiq Materials Limited, Pall Corporation, and Pathogen Solutions.